Blue Dragon, the well known brand for Oriental sauces visited the studio to have four cooked dishes using their new sauces photographed. 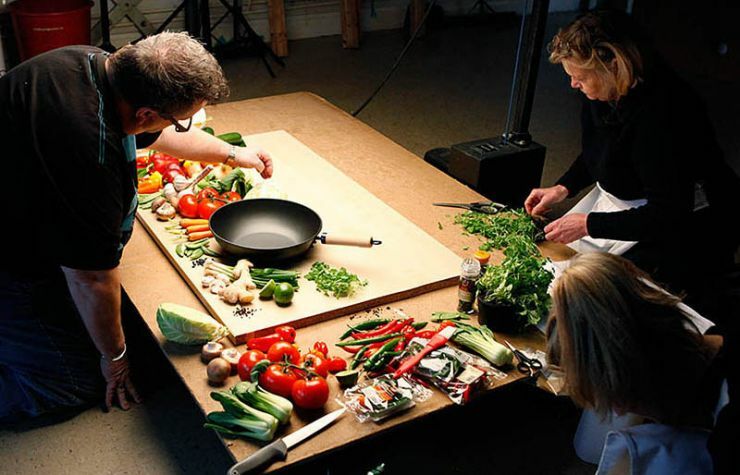 There was also a photograph of a wok accompanied by a substantial array of raw vegetables, the image was to be reproduced very big on the side of a marquee so attention to detail was vital, also the image file size had to be very big too! Lighting was relatively straightforward using just two lights; one light through a trace (for the hot food shots) and a Fresnel spot, all shot on a PhaseOne IQ180 (80MP) digital back mounted on a Linhof M679, digital Rodenstock HR and Macro lenses used. The shoot was attended by the client, the agency account handler and creative director, and two Home Economists. All went very smoothly considering the threat of snow and disruption on the roads the night before. Lunch was supplied by a local caterers, the coffee sponge cake went down particularly well! "Just a note to say thank you so much for today – it was good fun, super productive and the end results are, I think you agree, superb."